Crochet instructions for a gorgeous triangle shawl with a fan pattern. Make this stunning shawl which is sure to get you many compliments! It is the perfect accessory for those cooler nights when you want something pretty and alluring. Finished shawl measures 75" across and 35" from top to point (excluding fringe). You may substitute with 340 yards of chunky/bulky weight yarn for the shawl and a ball of ribbon yarn for the fringe (optional). 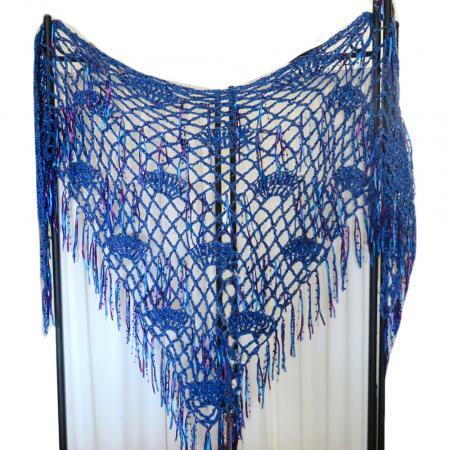 The shawl features a bottom-up construction so it can be adjusted to your desired length.